Engineered with BC-enhancing profiles, a synthetic tip and a thick, robust jacket, Sierra’s new GameChanger is an outstanding evolution of the company’s big game bullets. Sierra has for decades been at the forefront of bullet accuracy, yet it has lagged behind in bullet innovation. Handloaders enthused over Sierra hunting bullet accuracy but lamented the lack of a composite-tipped version that would protect tips during recoil in the magazine box and while bouncing up feed ramps, as well as provide enhanced aerodynamics. With its recently introduced GameChanger—aka Tipped GameKing—Sierra has entered the modern age of hunting bullets. The new GameChanger should provide the excellent accuracy the GameKing is known for coupled with the durability and flight-enhancing characteristics of a robust but refined synthetic tip. One of my first questions was whether the tip material was traditional polymer or some sort of heat- and erosion-resistant material, similar to what Hornady and Federal advertise. While the GameChanger’s core is not bonded to the jacket and there’s no mechanical locking mechanism, Box assured me the jacket design does a good job of keeping the bullet together. Sierra’s website lists the new hunting bullets by diameter and weight as “TGK,” an acronym for Tipped GameKing. Yet where it’s spelled out the company calls it the GameChanger. Which led me to wonder what it’s actually called. Sierra’s traditional GameKing (l.) compared to the new GameChanger. In addition to the tip, note the difference in profile and jacket thickness. 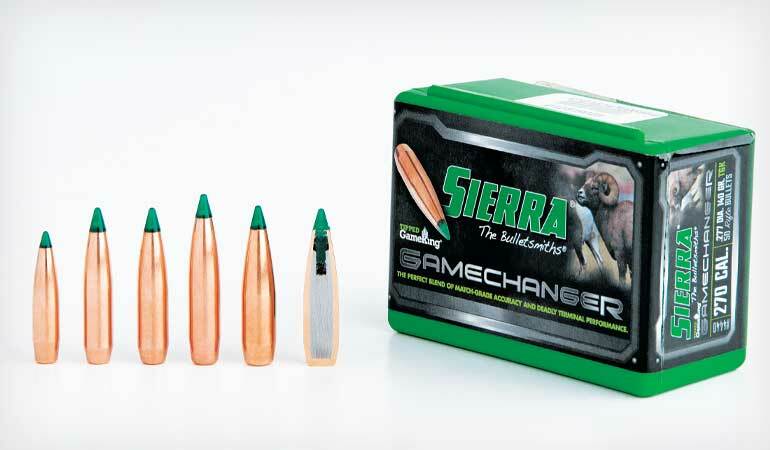 According to Box, Sierra designed GameChanger bullets to provide a blend of the most commonly valued characteristics. In addition to the synthetic tip, aggressively tapered jacket, optimized shoulder angle and sleek, high-BC profile, each caliber/weight is carefully engineered to stabilize in common, standard rifling twist rates. You don’t need a custom, fast-twist barrel to get the most out of Sierra’s new hunting bullet. As yet, no ammunition company has begun offering factory-loaded Sierra GameChangers. Best handloading results come with the bullet seated near the rifling leade, although, as Box pointed out, the 1.5-degree shoulder angle allows the bullet to shoot well if jumped, too—within reason. I tried the 165-grain version in a .300 Short Action Ultra Mag with a long throat, and it didn’t do particularly well when jumped 0.170 inch to the leade. In my favorite 6.5 Creedmoor, a custom gun built by Elk Meadow Performance, I was able to seat 130-grain GameChangers to kiss the rifling. Loaded with Reloder 16 powder, it generated 2,939 fps in muzzle velocity and averaged 0.48-inch groups at 100 yards. To see how accuracy held up at longer distances, I put a torso-size steel target at 600 yards, ran a quick calculation on my iPhone app, and fired my last three shots at it. All impacted center, and the resulting group measured right at 3.5 inches, fickle wind notwithstanding. I’ll take that any day of the week. Initially there are five different GameChangers in the lineup, starting with a 90-grain 6mm/.243 (G1 BC .490). 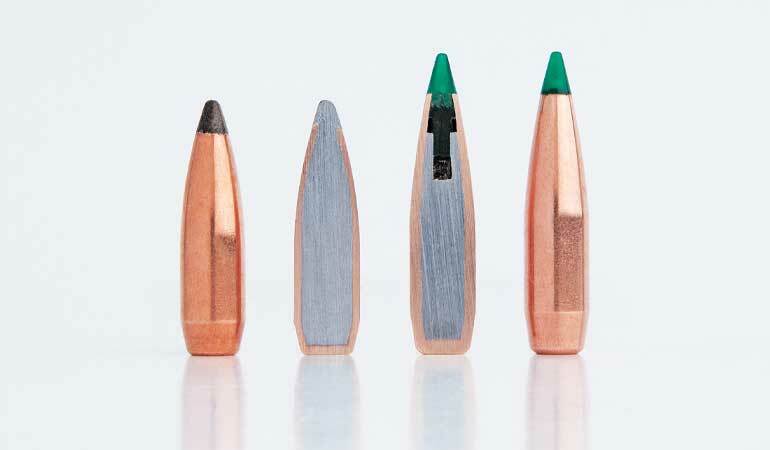 Next is the 130-grain 6.5mm/.264 mentioned above (BC .510), a 140-grain .277 (BC .508), a 165-grain 7mm/.284 (BC .610), and a 165-grain .308 (BC .530). Perhaps the most standout of the five initial GameChanger offerings is the 140-grain .270 caliber version. As you may know, traditional-weight .270 projectiles are not known for inherently high BCs. This one’s G1 BC of .508 is admirable as .270 bullets go. That said, the single most capable of proper long-range performance is the 165-grain 7mm version. Most long-range enthusiasts disregard projectiles that rate a BC of less than .600. Because I like to see what the inside of a bullet looks like, I sectioned a 165-grain .30 caliber version, and then did the same to a 165-grain GameKing in order to compare jacket thickness and construction. As Box suggested, the GameChanger has a significantly thicker jacket with a more aggressive taper. It also has an expansion cavity below the stem of the synthetic tip. Basically, it’s a more complex bullet than the traditional GameKing, which is both good and bad. Good because it offers enhanced ballistic and on-impact performance. Bad because more complexity adds more variables with the potential to introduce inconsistencies. Only time and a lot of shooting will tell whether the GameChanger is as forgivingly accurate as the GameKing. I look forward to finding out. The GameChanger is available in boxes of 50 or 100, easing the cost of buying a box to try in your rifle. Depending on specific version, cost runs from a bit less to a bit more than for the GameKing, starting at $17 to $26 for 50 and ranging up to $32 to $50 per 100. Sierra provided a way for shooters to tell the difference between GameChangers and Tipped MatchKing bullets. The former have translucent green tips, while the latter have slightly darker, non-transparent tips. This is important because the two have similar profiles and could otherwise be easily mixed up. Paul Box was right: Sierra’s GameChanger is not just a Game­King with a tip. It’s much more than that and is almost undoubtedly the best big game bullet Sierra has ever produced.